In a quest to stay healthy, many people are seeking natural ways to prevent neurodegenerative diseases. Recent studies show that pomegranate extract, which is a rich source of disease-fighting polyphenols, can help protect against the development of Alzheimer’s disease. But researchers weren’t sure which molecules to thank. 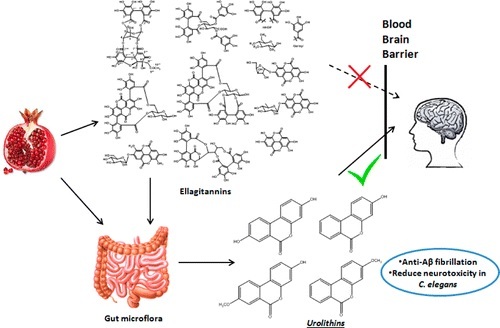 A team reports in ACS Chemical Neuroscience that the responsible compounds may be urolithins, which are made when gut bacteria break down the polyphenols in the extract. Alzheimer’s disease is associated with ß-amyloid (Aß) fibrillation, a process in which amyloid proteins in the brain form clumps. To fight the formation of these fibrils, however, a molecule would have to cross the blood-brain barrier — a series of cell junctions that prevent certain substances from entering the brain. In previous work, the researchers showed that a pomegranate extract has anti-Alzheimer’s effects in animals, but they did not identify the compounds responsible. Navindra Seeram and colleagues wanted to investigate which compounds in pomegranate could both pass through the blood-brain barrier and prevent Aß fibrils from forming. The team isolated and identified 21 compounds — mostly polyphenols — from the pomegranate extract. Computational studies found that polyphenols could not cross the blood-brain barrier, but that urolithins could. Urolithins are anti-inflammatory and neuroprotective compounds that are formed when ellagitannins, a type of polyphenol, are metabolized by gut bacteria. The researchers then showed that urolithins reduced Aß fibrillation levels in vitro. Additionally, these compounds increased the lifespan of an Alzheimer’s roundworm model. They say further tests are needed to determine whether the protective effects of these compounds could ultimately help prevent or treat Alzheimer’s in humans.